May 8, 1861 – It all could have been worse, as a day later the Chicago Tribune reports under the headline “Whisky and Water” … “The watchman on Rush street bridge yesterday morning just before daybreak heard a cry of distress from the water near the south abutment, and going thither succeeded in saving the life of a gentleman from the rural districts, named Dun, who coming in on the cars got gloriously tight, and suddenly on his travels found himself diluting the whisky he had swallowed with the whole amount of water in the river. He was saved, damp and damaged, and with a sprained ankle. He is now in the Hospital.” This would not be the last time someone from “the rural districts” found himself “gloriously tight” in the city. The photo above shows the bridge at Rush Street in 1860. May 8: 1929 – After knocking the 600-ton Clark Street bridge from its foundation on April 30 the Sandmaster, a dredging vessel, is singled out by Assistant Corporation Counsels Charles McDonnell and Thomas W. Barrett, who prepare a suit against the owners of the ship. 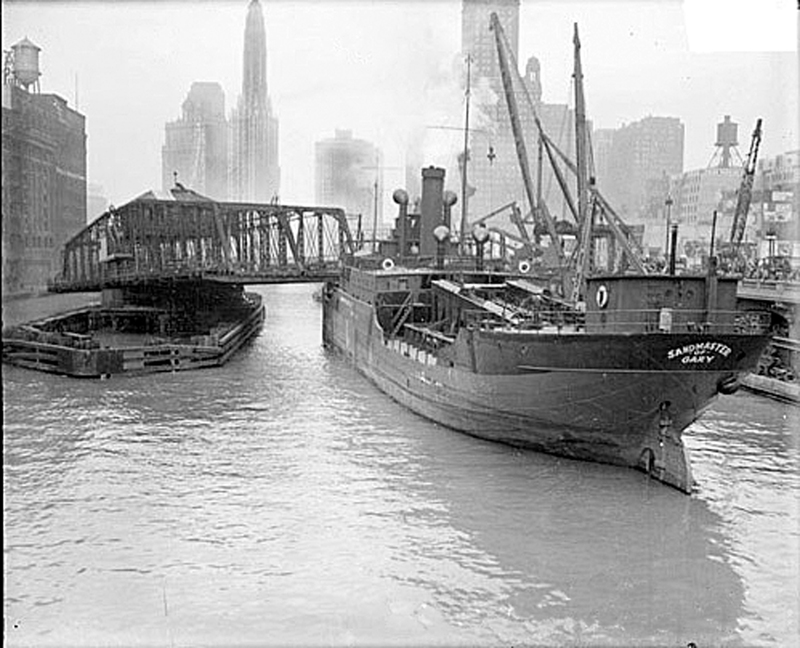 Records indicate that since May 21 of 1926 the wayward Sandmaster has struck 13 city bridges on 44 separate occasions. In these three years the ship rams the Fullerton Avenue bridge 18 times and the Diversey Boulevard bridge 13 times.